Photo: Leo Shaw, The Seattle Aquarium. The juvenile and adult stages of many fishes and bird species are important mid-level consumers. The diet of these species in Puget Sound can vary dramatically in breadth and complexity and can contain prey from many different habitat types. For example, some juvenile Chinook salmon have eaten (at any one time) terrestrial insects, aquatic insects, amphipods, copepods, polychaetes, fish larvae, and crab zoea (Brennan et al. 2004). Planktivorous fish feed in water-column habitats associated with nearshore and open marine waters of Puget Sound. Based upon their abundance/biomass, Pacific herring, juvenile salmon, juvenile Pacific sand lance, and northern anchovy are probably the most important planktivores. Other noteworthy species in this group include several important rockfish species (black, canary, widow, and yellowtail rockfish), and some species of marine birds that forage on amphipods and euphausiids (e.g., Bonaparte’s gull). A wide variety of species of copepods, crab larvae, and euphausiids or krill are usually elements of planktivore diets (Strickland 1983). Diets of planktivores can vary over relatively small spatial and temporal scales, which is consistent with the boom-and-bust dynamics of their prey (e.g. barnacle larvae, copepods, and crab larvae). In contrast to the planktivorous fish, there are many species of birds and fish that eat mostly invertebrate food items found on or in the benthos. There are far more species in this trophic group than in any other groups. What one species eats depends upon many factors, including varying environmental conditions, habitat (e.g., deep versus shallow), and predator and prey morphology (e.g., bill size and shape). 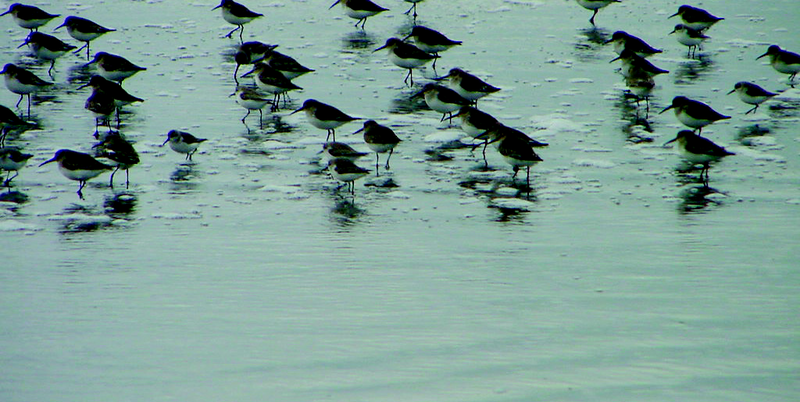 Shorebirds such as plovers, yellowlegs, killdeer, and many migrating sandpiper species forage in the sediments left exposed by the ebbing tide – a common scene in sand and mudflats around Puget Sound. Flatfish often eat the tips of bivalve siphons, and there are species that eat their prey off the substrate surfaces such as oystercatchers, gulls, and scoters. Some of the abundant surfperches such as shiner perch primarily also forage on organisms that occupy substrate surfaces. The development of the Sound Science document has been a collaborative process among scientists from a variety of disciplines and institutions throughout Puget Sound. The content reflects the wealth of knowledge in existing plans, research projects and personal expertise. The open dialogue and vigorous discussion about the interactions between components of the ecosystem, key threats to the system and critical science needs is almost as significant as the findings themselves. This document is the product of over 30 authors and almost 100 reviewers from federal, tribal, state, local, non-governmental, and academic institutions across the Puget Sound region. In total, hundreds of natural and social scientists have contributed either as co-authors, through extensive reviews, or by participating in workshops to debate and improve the information. We believe that the resulting content of the document thus reflects the collective views of the broad community of natural and social scientists familiar with Puget Sound. Key contributing agencies: King County Department of Natural Resources and Parks, National Oceanic and Atmospheric Administration (NOAA), Northwest Indian Fisheries Commission, People for Puget Sound, Puget Sound Action Team, The Nature Conservancy, US Environmental Protection Agency, US Geological Survey, University of Washington, Washington State Department of Ecology, Washington Department of Fish and Wildlife, Washington State Department of Health, Washington State Department of Natural Resources.